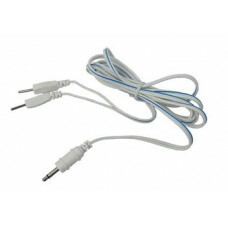 These lead wires ("cables") for TENS devices come in various connection sizes, such as 2.0 mm or 3.5 mm. A chief consideration when getting replacement lead wires is the connection size. All TENS and EMS devices can usually use the same types of lead wires, as long as the connection size is correct for (will fit into) the device.